It’s the 79th running of the race that was the Hollywood Gold Cup until 2014. 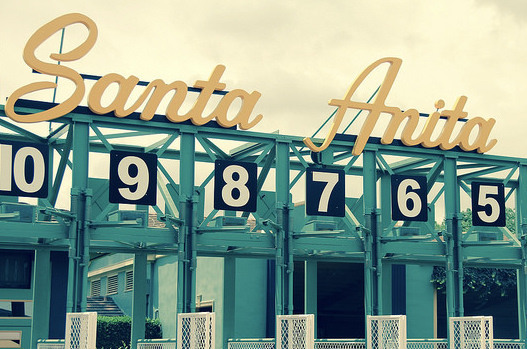 Yes, a short field of 7 will go to the starting gate at Santa Anita in this GI affair. But in that field are three horses who should be considered leaders of the Classic division and who may duke it out again in the Breeders’ Cup Classic at Churchill in early November (It’s a “Win and You’re In” race for the Breeders’ Cup.) The horses will run the classic distance of 10 furlongs. Accelerate had been a nice horse, but he burst on the scene when he beat superstar Arrogate in the San Diego Handicap at Del Mar last summer. He then finished 3rd in the Pacific Classic and had a subpar performance at a mile in the Breeders’ Cup. This year, he’s 2 for 4, with a dominating performance in the GI Santa Anita Handicap — at today’s 10f distance — and a useful win in the G2 San Pasqual. All 4 of his starts have yielded Beyer figures over 100, topping out at 110 in the Santa Anita Handicap. His two losses are to Giant Expectations and by a neck to City of Light who lines up two posts away from him today. City of Light burst on the scene with an impressive performance sprinting 7f against fellow 3YO’s in the year-end GI Malibu and followed it up again with a 7f win against older in the Triple Bend. The former sprinter then stretched out in the Oaklawn Handicap and, as mentioned, defeated Accelerate by a neck. All three performances (including the Malibu) have brought triple-digit Beyers, topping out at 107 at Oaklawn, where he established himself as a router. He’s never gone 10f — only going the 9 at Oaklawn — which raises a bit of a question. Dr. Dorr is new on the scene. It took him a while to pass his conditions, but he’s been a different horse this year. He passed his N2X in March over a wet track at odds of almost 12-1 and then won the Santana Mile convincingly as the favorite. He made his graded stakes debut in the prep for this race — the G2 Californian — where he received a Beyer of 108 and decimated the field at 9f. Like City of Light, he’s a former sprinter and has never gone the 10f distance of today’s race. But he’s passed every test given to him this year. The rest of the field is behind the top 3, although there are some upset contenders. Pavel finished 4th in the GI Dubai World Cup and has some useful finishes in top level races. His best win to date is in the G3 Smarty Jones and his best Beyer came in the GI Jockey Club Gold Cup, where he finished 4th. He seems best used underneath. Full of Luck was soundly beaten by Dr. Dorr in the Californian and would need to improve significantly to reach the top 3. The same goes for Prince of Arabia, who appears outclassed by the top of this field. Little Scotty has risen through the claiming ranks and had a nice performance at the optional 40K level at 10f. But, again, he’d need to improve quite significantly to catch the top 3 in this field. Analysis: It’s a hard race to make money unless you really like one of the top 3 and combine him with an upset finisher in the exacta. I don’t expect that to happen as the top 2 will likely come from Accelerate, City of Light or Dr. Dorr. I like Accelerate to win because he’s proven at the 10f over the track and has shown he’s a fan of the distance with his two best Beyers at 10f.